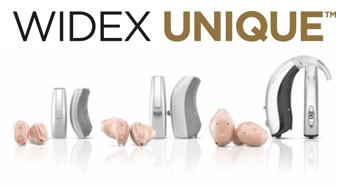 The premium range of hearing aids from Widex. As you would expect, Widex have produced an excellent range of hearing aids, with a number of features not available in any other hearing aid. 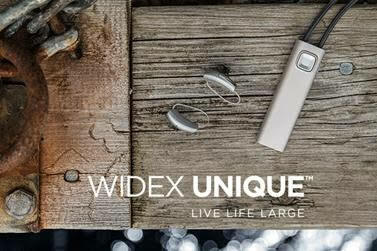 Widex hearing aids are already known for their own unique sound, now combined with some ground breaking features we think that they can justify calling the product "Unique"
There are three sizes of behind the ear model and three in the ear models available. The Passion is the slim, attractive behind the ear receiver-in-canal model and is suitable for most hearing losses. It has no manual controls so can only be adjusted by remote control or app. The Fusion is the larger, more powerful behind the ear model which also features a push button for program changing. The Fashion is the largest of the over the ear models and is mainly for people who want or need a full earmold. Of the three in the ear models, one is the standard sized in-the-ear, one is the CIC or completely-in-the-canal. The smallest is the CIC-M which is Widex's equivalent of an IIC or invisible-in-the-canal. Being so small, some features had to be cut from this model, mainly anything requiring wireless communication which this aid cannot fit in. 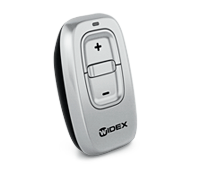 WIDEX UNIQUE 440 CIC-M : This is the smallest of the range, it is a non-wireless micro completely in canal device using a size 10 battery. WIDEX UNIQUE 440 PASSION: The Passion has for many years been the smallest RIC hearing aid available. It is a wireless mini receiver-in-canal device which uses a Size 10 battery. The size does limit the device though, it has no telecoil or programme button. WIDEX UNIQUE 440 FUSION: The Fusion is a larger wireless receiver-in-canal device, it comes with a push button and telecoil and runs on a size 312 battery. The Unique 440 uses Widex's new U-platform chip which processes sounds across 15 channels. 15 channels is typical of all Widex top of the range aids. What is different for Widex though is the use of "Sound Class Technology", the hearing aid classifies what kind of sound environment you are currently in out of a choice of nine possible environments that are programmed in. It then adjusts the sound accordingly to maximise your ability to hear speech sounds clearly. The 440 has the most channels in the range and also has a "High Frequency Boost" feature that isn't available in the lower models to give additional clarity when needed. IE technology allows both hearing aids to act as one system through the instantaneous wireless exchange of information. Widex uses this technology in order that the hearing aids can act as a true pair. The two hearing aids can synchronise their noise reduction, compression, and directionality settings, which allows them to not only enhance their effectiveness, but to also deliver a more natural hearing experience to you. Widex claims that it's new wind noise attenuation feature is an industry leading wind noise reduction feature. Widex don't make claims very lightly, so we would be of the opinion that if they say it, it is true. The Unique 440 can attenuate more wind noise than any other hearing aid out there, no matter the direction the wind is coming from, even from directly ahead. However this new feature is only available on the 440 models. All manufacturers have good background noise reduction features as standard these days. 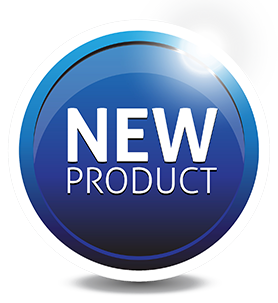 However, Widex have introduced a new feature that has extra emphasis on reducing softer, low level background noise that may be annoying. Widex have always put great emphasis on soft sound inputs because they believe that soft sounds in speech are very important for understanding. However, there are soft input sounds that you just don't want to or need to hear, like a computer fan or the noise of a fridge. Widex have also introduced a wider dynamic range of hearing to the Unique so you can hear more than ever. What this means is that most hearing aids take a range of sounds from quiet to loud and compress them into what hearing you have remaining to provide you with the full range of sounds for you to hear. They often ignore the very softest sounds and don't process louder sounds very well. What the Widex Unique hearing aids are doing is extending that range slightly so that very very quiet sounds (5dB) that aren't picked up by normal hearing aids will now be processed enabling you to hear the low sounds that most hearing aids ignore. Nearly all modern Widex aids have the option to use Zen tones, Zen is a proprietary feature belonged to Widex that will help to reduce the effects of tinnitus. For tinnitus sufferers these predictable yet non-repetitive sounds are used in combination with counselling and relaxation techniques to deliver tinnitus relief as a part of a tinnitus management programme.